Get your pop some pierogies from Tops (ma's)....had some fresh this evening. Nothing like fresh - i really don’t liked the smoked stuff. Hanzlian’s makes the best, IMHO. I will be bowling early Monday (and drinking Krupnik and pivo) with the Pauline Fathers at Corpus Christi’s Sears St. Athletic Center (and bar), head to the Adam Mickiewicz Library (aka ‘Mickey’s), watch Eddie Dobosiewicz’s Dyngus Day Parade, then (there will likely be stops at R&L Lounge and Artie’s in between) head to Central Terminal to polka my dupa off!!! Too many things to list. Also the fact that there is two of everything makes one wonder if he wasn't meeting another conspirator. Anybody see Jesus in the fire? “I offered the help of our great experts on renovation and construction as I did in my conversation yesterday” with Macron, Trump wrote. Will that be able to be a deduction on taxes? Maybe they can withhold a little less this year so we can all donate. hmmm are donations to a foreign country tax deductible? I doubt that, but donations to a qualifying charity that provides benefits to foreign recipients may be. LoL... Yeah, but your local church ain't anymore. I say we water bomb it! Good ole Airplane Eddie,the last time I saw him, he was chewing it up with Ronnie D and Wanda at the festival in Cheektowaga.She looked terrible,I think she may have passed on. 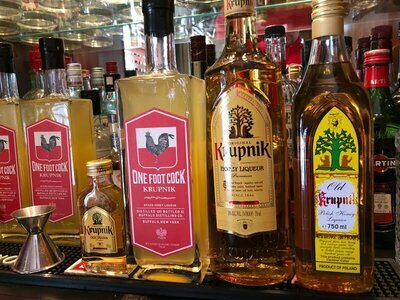 P..S.- Believe it or not..I have never had krupnik. I see Eddie at Corpus Christi occasionally, not so much at the R&L any more. Can’t believe you’ve never had Krupnik. My dad brought some back from Poland (they make it much stronger there), along with some 150-proof Wisniowka (cherry vodka). Fr. Krysa (St.Casimir’s) whips up some homemade Krupnik every year around Easter time - once set his kitchen on fire doing it. France is thinking they can have the cathedral rebuilt in 5 years. Sounds about right, if they begin immediately. But I think their cost estimates are way too low - I’m guessing a couple $billion. Maybe the Clinton Foundation can step in with a few million. Chelsea's wedding is over so why not? Oh wait.....the foreign division of the foundation closed down immediately after she was unsuccessful at stealing the election!!! Since a completely unqualified Hillary was handed a Senate seat by Pat Moynihan and lied to New Yorkers about her Presidential intentions (she fooled no one - we all knew she was lying), then proceeded to be rejected twice - once by her own party, once by the entire American electorate - I have pretty much been able to forget about the inbred hillbilly family from Arkansas. Oh wait.....the foreign division ﻿of the foundation closed down immediately after she was unsuccessful at stealing the election!!! but really, Don's offering platitudes and failing doing so. If he wants to help cash up or shut up. Offer words of sympathy and move on. Don't suggest they drop tons of water on a burning building. The same method he said "failed miserably" on the fires in California and then said he wanted Cali to repay the Fed. Don says so many stupid things on a daily basis - I can’t keep track anymore. I’m glad Bill Weld declared, but he has no chance. I’m still hoping for MD Gov. Larry Hogan. Otherwise, I’ll wait for the 19 incompetent Dems to self-destruct, hold my nose, and re-elect the President. How ‘bout the knucklehead that wanted to celebrate the 20th anniversary of Columbine by doing it again? It’s hard, as a Christian and a Catholic, for me to say this, but I feel safer that she’s dead. I know they want it done by the 2024 Summer Olympics, but my understanding is it could take years just to assess the damage. It's not like you can just grab a trowel and mortar and start having at it. But I wish them all the luck they need to do it. There’s debris removal, engineering and architectural assessments, finding - if they even exist - the original plans, finding and hiring the right experts, procurement and what not, the list goes on and on. It could take decades. Have they bothered to consider how many years it took the build the thing? Me too. Maybe Weld will prompt others to challenge and get us back to sanity. How much cash does the wealthiest enterprise in the world really need...? Of course.....the money is pouring in right now. Maybe 30% will actually be funneled to materials and labor, 50% to administrative costs and 20% to back door deals and other shady business.